One hundred and ninety to one hundred and ninety-seven degrees Fahrenheit, or eighty-eight to ninety-two degrees Celsius. Coarseness or fineness of the coffee grind may vary based upon the espresso machine used. Generally an espresso grind is very fine, almost powdery. The grind size for a steam-driven espresso machine should be finer because the espresso machine (espresso coffee maker) doesn’t have as much pressure to push the water through the grinds a pump-driven espresso machine. To assure consistency of grind size, use a Conical Burr Grinder rather than a Wheel Burr Grinder or a Blade Coffee Grinder. Eight to ten Atmospheres, or Bars, of pressure. This is equal to about 135 pounds per square inch. Six to nine grams of ground espresso beans should be used per shot of espresso. Approximately twenty-two seconds. The optimal time for brewing an espresso may vary due to several factors such as the brewing temperature, fineness of the grind, and how compacted the coffee is in the portafilter. The brewing time will almost always be in the range from eighteen to twenty-five seconds for a shot that is one to two ounces (thirty to sixty ml) of espresso. For tips on producing an excellent crema, see Pulling a Perfect Espresso Shot and How to make a Latte. For detailed definitions of coffee terminology see the Espresso Coffee Guide’s Coffee Terms. 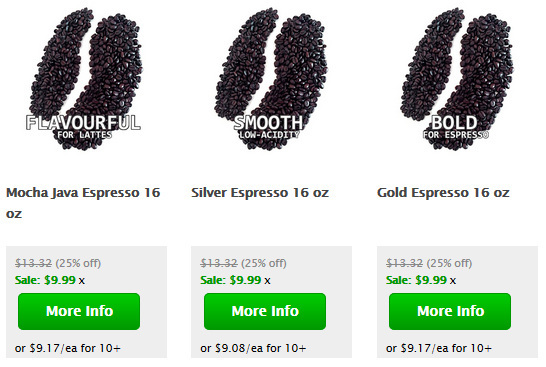 To read detailed specialty coffee flavor profiles see Gourmet Coffees and Espresso Drink Recipes. If you enjoy history see the World’s Best History of Coffee.